I know to make them from scratch. I actually prefer them that way. But yesterday our Princess had to forgo tasting a lovely bakery confection because of her food allergy. If I can’t guarantee it as 100% safe, it doesn’t happen. And usually she’s okay with it–she knows it’s important and so she adapts. But yesterday she got so frustrated and was so disappointed (“I hate my allergies, I hate my allergies!”), it broke my heart. After we ate I was busy cleaning up the kitchen and then working on Christmas-y things. Both our Princess and Cooter came in asking for a cupcake. Seriously, people? You just ate (or picked at) lunch. No. Just no. Cupcakes can be afternoon snack. Please at least act like what I fixed you for lunch sustained you for longer than 2.5 seconds. As luck would have it, at 2:29 I was in the laundry room with my head stuck in the washing machine, digging out the last five items from the bottom of the washer. (It’s a tall washer. I am not.) I heard their excitement as they counted it down. 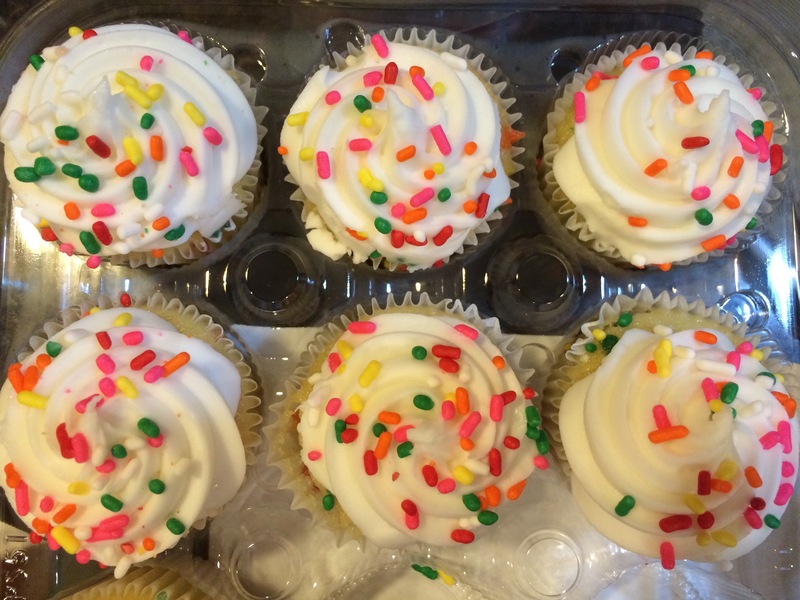 It was cute, but it was not without a little bit of exasperation that I wondered if they would SEE with their eyes that I was a little occupied at the moment and grant me an extra minute or two to get to those much-anticipated cupcakes. I heard them wondering where I was. Nope. They wouldn’t be able to see past the cupcakes when the clock read 2:30. And before I could get all self-righteous and huffy, thinking, here I am doing their laundry and they can’t just wait….. I had the wind taken out of my sails. And I realized that I do that too. I have my sight set on something–a goal, an event, an item–and all I can think about is that. Not what the person who can help me with it might be going through or what else might be going on in the world at that exact moment that I want this/need this/anticipate this to happen. I can’t see anything beyond the “something” in that moment. It is so easy to become self-centered and focused on something such that nothing else matters. I quickly started the dryer. And moved toward the cupcakes. I had given my word, after all. They were given out post haste, and the enthusiasm and excitement over them was worth it all. My girl was tickled to find something bought that she could have. And they were really quite pretty too. Tonight I’m thankful for the reminder that it isn’t all about me. It’s easy to fall into that mindset. Way too much so. And while it’s important for the littles to learn it’s not always about them, it’s also important that I do make it about them from time to time. And what better way to do that than with lovely cupcakes? Wishing you all someone to make it about you, and someone for you to make it about them. That’s what keeps the world turning, I think. We all matter.